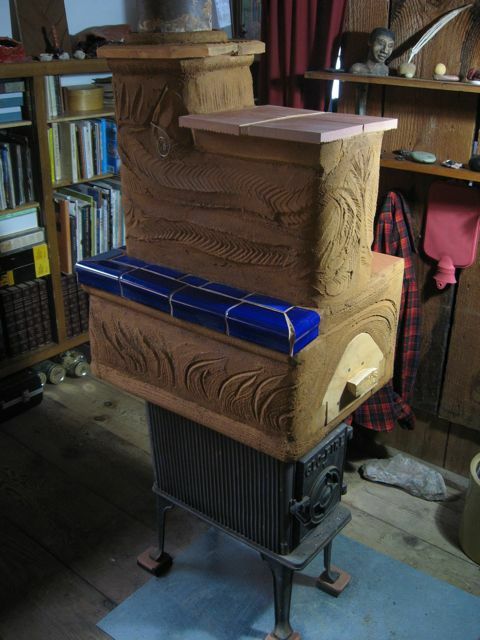 By adding masonry and mud to an old cast-iron wood stove, I greatly increased its efficiency — and it even has an oven! (note the wooden door on the right, just above the iron stove door). The wood that used to over-heat me, briefly, in the morning, now keeps me comfortably warm all day, and into the next morning (depending on how long I fire it and how cold it is). And, unlike most iron stoves, it no longer generates that fierce, dry heat that you can only moderate by burning wet wood, or by damping the fire down to a messy, smoldering smoke generator (both strategies will cause dangerous buildups of creosote in a chimney — a major fire hazard). Masonry heaters, and similar adaptations like this one, burn much cleaner, and don’t typically generate creosote. A few minutes after lighting it (depending on the size and dryness of the wood), no visible smoke comes out of the chimney. I typically burn it for less than an hour and have heat all day (western Oregon is rarely sub-zero). In my under-insulated cabin, the “heater hat” usually holds heat until the next morning.Â And (if I start a fire early) I can bake breakfast potatoes in it…). The surface temperatures of the heater portion are also much lower than hot iron and (except for the tile, which gets hotter), very huggable. Old stoves can burn pretty clean — if you open the dampers up wide, and if you can line the firebox with firebrick, which raises combustion temperatures so more of the fuel burns, and burns more completely. When you line the firebox with brick, it also keeps the metal surfaces cooler and safer. Inside the “hat” itself, combustion gases vent out the back of the stove, up and around the oven, then zig-zag through the narrow top sections, and head out. Much more of the heat of the fire is captured in the masonry, so less escapes out the chimney. For more design details, including a new diagram, see the following post. I’m sure this set-up will generate lots of interest for people with these great old Jotuls and Morso’s. It looks, however, top-heavy and dangerous to me. How about some supplementary support for the upper portion? Yes, it does look top heavy. Initial design plans did include supplementary support, but I abandoned them after it got built because it was so stable (the chimney connection helps). Shock absorbent pads under the feet of the stove — to dampen vibration in a wooden structure — also made supplementary support more complicated — all extraneous to the basic design, which works! Every job is different! — K.
Kiko… A brilliant idea. Maybe I live under a rock but this is the first I’ve seen of this. We have a well made, efficient stove, but still experience the swings in room temp and I am not satisfied with the amount of smoke that comes from our unit when it is not running hot. This just might solve two problems in one. A great permaculture idea. After doing a masonry heater workshop with Albie Barden last year, I started dreaming up a similar, but modular add-0n system for iron stoves, looking for lightweight materials with good thermal properties. I didn’t get very far, but this beautiful example gives me new inspiration to keep working on it! I’m curious how you configured the flue – straight into the chamber of the add-on, or through a longer path that maximizes thermal transfer (similar to masonry heaters?) Thanks. The path is maximized as follows: flue enters the masonry unit on the left; the bottom, wider section is designed somewhat along the lines of a bell stove, and includes the (small) white oven; then flue gasses go back up at the rear left (out of sight); then they travel from left to right, then up, then right to left, then into the metal pipe. “Lightweight materials w/good themal properties”? Isn’t that a contradiction in terms? Thanks for sharing this information…..this is really huge for someone like me that lives in Maine and is searching for cost effective ways to heat more efficiently….this comes the closest I have seen to the “common man” masonry heater. I have a Jotul wood stove and would like to duplicate what you have done…I understand at a basic level your description of how the hot gasses move but it would help me allot to see exactly how you achieved the path you describe in pictures. Do you have pictures of the build or maybe a drawing you could email or point me to? If not could I compensate you somehow to produce some thing like that for all of us? Hi Dave – I agree with you that this design is marvelous. And reasonably do-able, though I doubt many of us could finish it as nicely as Kiko. If you are interested in another ‘everyman’s masonry heater’ option, we will be in Maine in late September, 2012, doing a rocket mass heater workshop. Please get in touch if you want more details – even after the fact, we may be able to help you reach other Maine / New England folks with similar interests. And Kiko – I’d be happy to make a sketch of this into a pretty drawing if you don’t have time. The description is pretty clear, but a diagram would be highly useful and I’d like to share this idea with folks who don’t have room for a full-scale mass heater. Dave, if you’re still there, I’d love to know if you ended up building anything. And if not, we did finally publish some drawings, downloadable free from the bookstore. thanks! We have wood burning inserts in both our upstairs and downstairs fireplaces. The fireplaces are built into a brick structure that includes chimneys for three fireplaces and our old oil furnace (that we never use; we heat exclusively w/wood). I would love to somehow convert our current arrangement into a thermal mass stove by heating the brick, but don’t even know if that can be done. Can you recommend anywhere I can go to explore this more? My internet research hasn’t provided any helpful information. At this point, I am just trying to gather information. While it seems like something that should be doable, it’s very difficult to retrofit the mass of an existing fireplace to include heat-exchange channels inside it. The most productive path way generally is to think of the fireplace as a chimney into which you can plug a mass heater which sits in front of it, for example. This often requires work to create or reinforce a foundation that you can build this new mass on. If you scan closely, there are some references to some fireplace retrofits for masonry heaters on this page of the MHA News.